[April 18, 2019] LINCOLN - Margaret “Martha” Connor Peifer, 83, passed away at her home surrounded by her loving family on Thursday, April 11, 2019. Second visitation: Tuesday morning at the funeral home from 9:30 a.m. to 10:30 a.m.
Margaret “Martha” Connor Peifer, 83, passed away at her home surrounded by her loving family on Thursday, April 11, 2019. Margaret was born on July 29, 1935, in Joliet, daughter of John Francis and Anna (McCauley) Connor. She married Jack Henry Peifer on February 16, 1998, in Lincoln. Margaret was preceded in death by her parents, infant brother John Francis Connor and brother Charles P. Connor. Margaret was a Franciscan Sister from 1953-1989. She was an educator in Chicago, Joliet and Ohio. She remained an associate of the Franciscans until her death. She published her autobiography “Nice To Meet Your Husband Sister Martha” in 2007. Margaret often said, “I came to Lincoln for a job – and stayed for love.” She met Jack Peifer in 1992 through his mother, who was the blood sister of Margaret’s first Superior, Mother Immaculate Buckstegge. They married in February 1998. Services for Margaret will be 11:00 a.m. on Tuesday, April 16, 2019, at Holy Family Catholic Church in Lincoln, IL with Rev. Jeffrey Laible officiating. 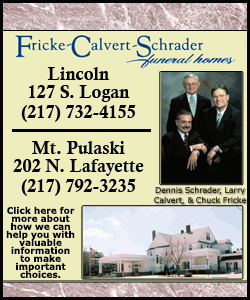 Visitation prior to the service, will take place from 9:30am-10:30am at Fricke-Calvert-Schrader Funeral Home, Lincoln. An evening visitation will take place from 4:00pm-8:00 pm on Monday, April 15, 2019, at Fricke-Calvert-Schrader Funeral Home in Lincoln. A Rosary service will be held at 3:30 p.m. prior to the evening visitation. Burial will follow the services at St. Mary’s Cemetery. Memorial donations may be made in Margaret’s name to Carroll Catholic School or Sisters of St. Francis in Joliet.